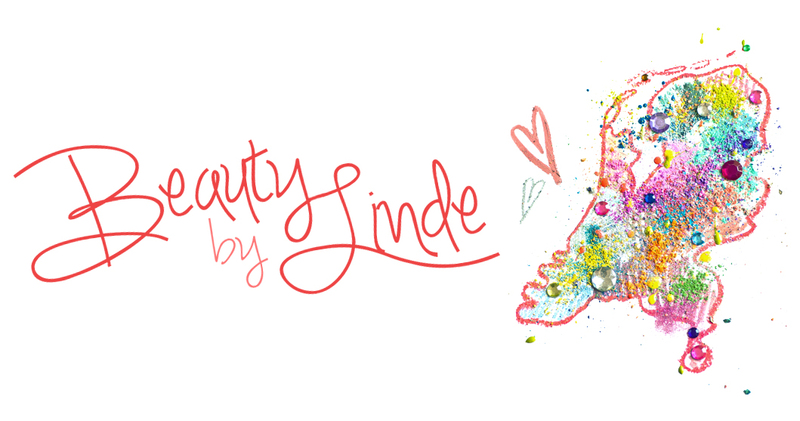 Beauty by Linde: W7 "Shades of Purple" Eyeshadow Quad: Review, Swatches & FOTD! 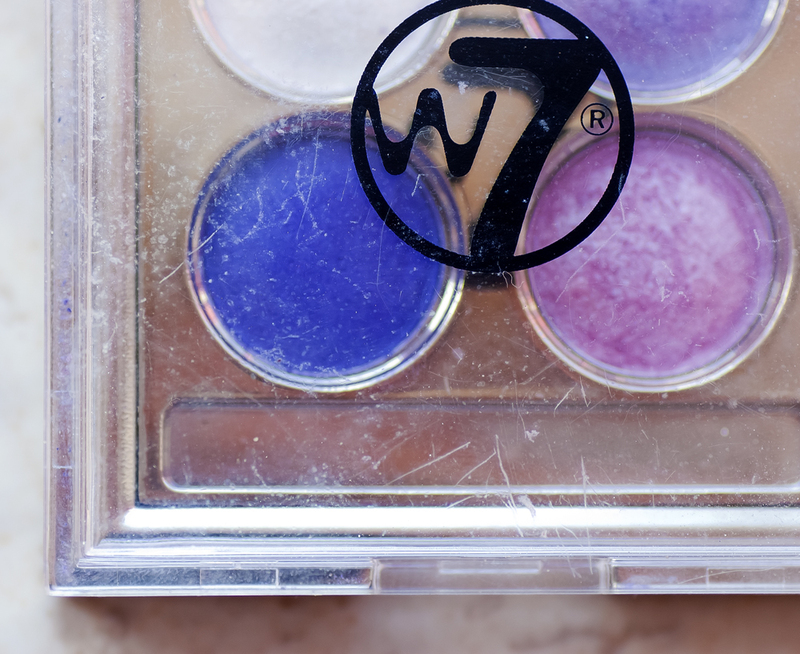 W7 "Shades of Purple" Eyeshadow Quad: Review, Swatches & FOTD! A few weeks ago, in my W7 "Shades of Brown" Quad review, I promised you that I'd tell you a bit more about the "Shades of Purple" Quad as well, so here I am! Read on if you'd like to see how I feel about this palette and if you'd like to know how I created this simple, bright smokey eye! As you can see, this palette contains a frosty white, a soft, kind of lavender purple, a pink/lilac and a deep bluish purple. All of these have a silky/velvety finish and the white, lavender and lilac have some subtle shimmer to them. As you can tell by looking at the swatches, these shadows have terrible color pay-off when used dry, but look fine when used wet. Both the dry and the wet swatches show the pay-off you'll get from one brushstroke, but these colors can be built up quite easily, especially when used wet. As you can see, the dark purple shows up a bit streaky and the white still isn't very opaque, but this diminishes when you give them just one more sweep of color. The packaging of this palette is exactly the same as the Shades of Brown one. It looks okay I guess, but I'm not a huge fan of it, because the high-shine interior tends to go filthy pretty quickly and the plastic cover scratches very easily - though I must admit I'm not the most careful when handling my makeup. But knowing that I haven't done anything to this palette that I haven't done to others before, I am quite disappointed in how easy this one got damaged to this degree. Anyway, although I like a products' packaging to look nice and luxurious, I do think that, in the end, it's about the product itself. So let's move on to the look I created using the Shades of Purple palette. I actually used the lilac color as a blush and the white as a cheekbone highlight! I chose to go for quite a basic and versatile look this time, since the bright colors already demand a lot of attention. I applied all my colors with a damp brush and blended everything using a dry blending brush, since it's pretty hard to create a seemless transition with a sticky, wet shadow. I started off by applying the lilac color to the center of my lids and the deep purple to both my inner and outer corners. Next, I patted the lavender inbetween the lilac and the purple using that same brush and then switched to my blending brush. I loaded with a bit of the lavender shadow and gently blended the lilac and the purple together, while making sure not to negate the pink highlight in the center of the lid. After creating a nice transition, I took my blending brush again and used it to blend a mixture of the lavender and the lilac shadows through my crease using windshield wiper motions. I took these colors all the way into my inner corners and up to the inner half of my brows, which you can see in the picture below. This gives the illusion of stronger brows and really intensifies the entire look (I even used my brow-powder to draw a subtle line from the inner part of my brows down my nose to enhance this effect even more, and also to slightly contour the shape of my nose). Then I took a little bit of the deep purple on my blending brush and blended this on top of the lavender and the lilac through the crease to give the look more dimension. To finish off, I applied a little bit of the white shadow to the center of my lid and to my browbone as a highlight. Create this exact same transition along your lower lashline and blend a little bit of the lilac shadow along the outer part of the eye (upper ánd lower lashline) to tie everything together. As I mentioned before, I applied quite a generous amount of the frosty white to my cheekbones as a highlight and I used the lilac shadow as a blush. I ran this on top of, and just below my cheekbones, so it would serve as both blush ánd contour. Then, I figured that this look wouldn't be complete without some crazy lashes. I decided to go for these babies, which go by the name of Intense from the Eylure Naturalites collection. I kept it subtle and went with a soft pink lipstick. Would you dare to wear this with a vampy, burgundy lip? I hope you enjoyed guys, see you in my next post! Wauw, prachtig! Echt heel erg mooi. Die nepwimpers maken het helemaal af. Wat plak jij die trouwens ook mooi en netjes op, haha toen ik dat laatst deed was dat echt heel hel geworden. Wat een gave foto's! Je lijkt wel een model... Prachtig! En de kleuren zijn erg mooi, staat je goed! Wauw echt super!!! Ziet er echt heel erg professioneel uit! Heb je een visagie-opleiding gedaan of gewoon jezelf aangeleerd? Mooie foto`s ook. Het is gewoon heel heel heel erg mooi, wat een prachtige ooglook en wat een prachtige kleuren! Mooi! You have a nice website too by the way, very cool wide-angle/fish-eye style pictures! the lashes are also awesome! !